The phenomenon of religious ecstasy was has been the focus of scholarly investigations and debate for centuries. The term implies an alteration of a person’s mental activity with attendant consequences for his interpretation of reality and of himself. While scholars of previous generations strived to establish the nature of ecstasy in order to classify it according to different typologies, the trend in the second half of the twentieth century shifted towards more comprehensive models for understanding the ecstatic experience within its historical and cultural context. 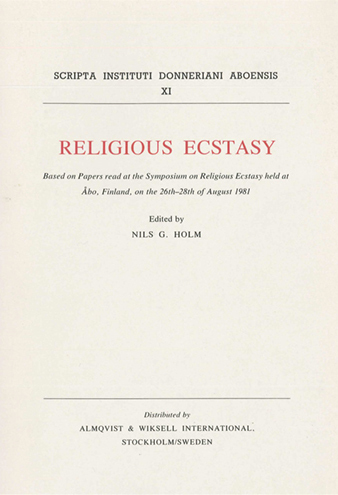 The current volume illuminates religious ecstasy from many sides, some offering more comprehensive theoretical appraisals of the phenomenon from psychological, sociological and historical points of view, others entering deeply into a single practice or personal experience in locations as varied as Siberia and Tibet. Scripta Instituti Donneriani Aboensis is a publication series published by the Donner Institute for research in Religious and Cultural History in Åbo, Finland. The aim of the institute, which is attached to the Foundation of Åbo Akademi University, is to conduct and promote scholarly research in the field of religion.